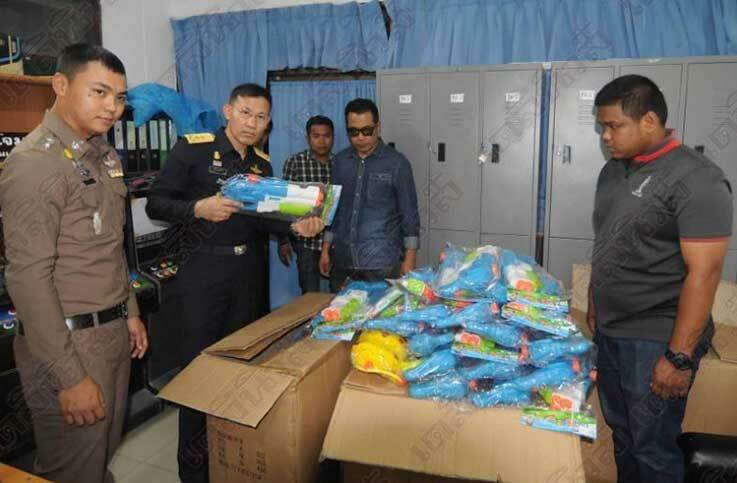 Police in Thonburi with a search warrant raided the premises of a toy trader yesterday and found a huge cache of guns – water guns for use in battles at Songkran. The trader could hardly believe that so many police and trading standards officers were on her doorstep – but now she faces ten years in jail and a million baht fine. Police Colonel Pratheep Charoensri was pictured handling one of the “high powered” weapons saying serious damage could be done if water went in someone’s eye. In total 192 guns in four boxes imported from China were uncovered at the four and a half story premises of Sukanya Kittisakdamrong, 50, in Ekachai Ropad Soi 10 in Jom Thong district. Sukanya is the owner of “Gift and Toys Import Export”. She was hauled in to Bang Khun Thian police station where she said that if the guns were illegal why didn’t customs stop them when they were imported in March? 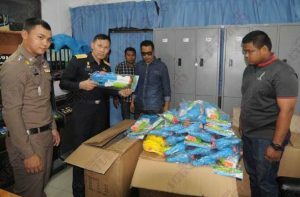 Pol Col Pratheep countered that his men were acting on a tip after the guns were found to be on sale at Sampeng market – a hotbed of activity in the sale of clothes and children’s toys. The trail led to Sukanya’s door. The Thonburi court swiftly issued warrant number 58/2561 and the police teams moved in. The water guns resembled any that you might expect to be on sale anywhere at any time but the authorities were determined. Daily News said that the the toy dealer faced 10 years behind bars and or a fine of 1 million baht. Thailand’s Songkran festival often features battles with Thais and tourists using what many would be Rambo’s like to think are war weapons……to squirt water.